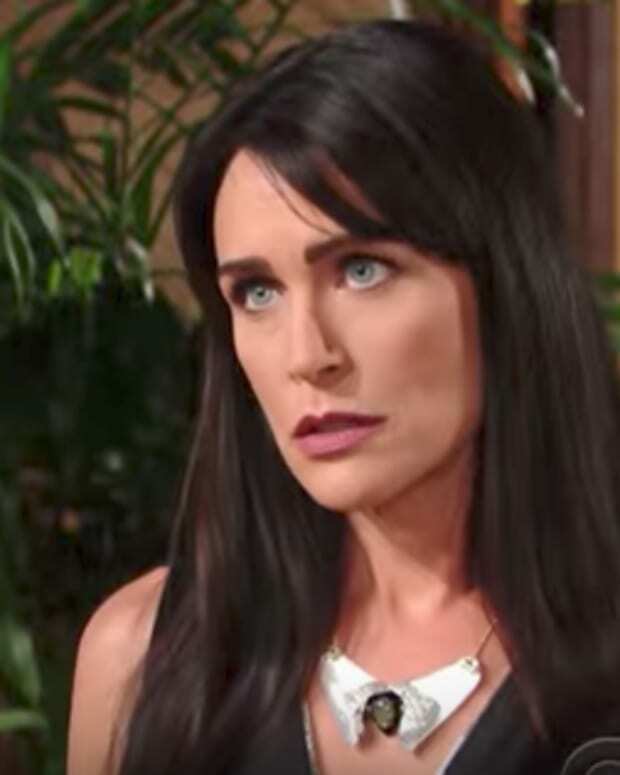 At the Forrester mansion: Katie teases Eric that its taking a long time for Ridge and Quinn to get honey, but he doesn&apos;t catch on. In the kitchen, Ridge tells Quinn their adolescent kiss-fest is done. He claims that he hasn&apos;t seen his dad so happy. Ridge adds that he will be happy once Brooke comes back. Sad Quinn claims she feels guilty for being so happy when Ridge isn&apos;t.
Back in the living room, Katie presses her hand without saying what she really wants. Quinn and Ridge look scared. What Katie really wants to know about is the status of her new job at Forrester. Eric thinks it would be great to have her on board and insists she come down to the office the following day. Eric decides it&apos;s time to get those drawings done NOW, so he leaves. Apparently, Ridge has to go to work too. When Eric leaves, Quinn blabs that Katie is blackmailing her. Ridge assumes that she wants to be the C-E-oh-no-she-better-don&apos;t (sorry, I can&apos;t help it). Ridge accuses her of wanting to catch them, but he insists he and Quinn are done. Ridge reminds Katie that they used to care about each other. She whines that she&apos;s not blackmailing him because Quinn offered the job. Quinn tells her that she will tell Eric everything when he comes home. Ridge doesn&apos;t think that&apos;s necessary. Quinn leaves the two alone. Katie wants to know why he&apos;s not fighting for Brooke. Ridge says he&apos;s not giving up on her. Ridge and Katie talk about Brooke and Quinn. At Brooke&apos;s: Bill comes into the Brooke&apos;s kitchen. He says he can&apos;t wait any longer. They make out before Brooke pulls out the scotch, caviar, and sushi. Brooke complains about the disappointments in her life, but not with Bill, because he&apos;s always there. Then we get flashbacks of all the places they&apos;ve been so we can see that Bill isn&apos;t lying about always being there. They talk more about scenes we saw this week, then kiss. Brooke goes up to her bedroom. Bill waits for her. She emerges from the shadows wearing dollar bills in all the right places. Bill&apos;s ready to use her like an ATM slot machine. First, Brooke unveils a wooden statue of a stallion (the horse, not Bill&apos;s man parts). He can&apos;t help himself, he has to whinny, which means something must have popped up. 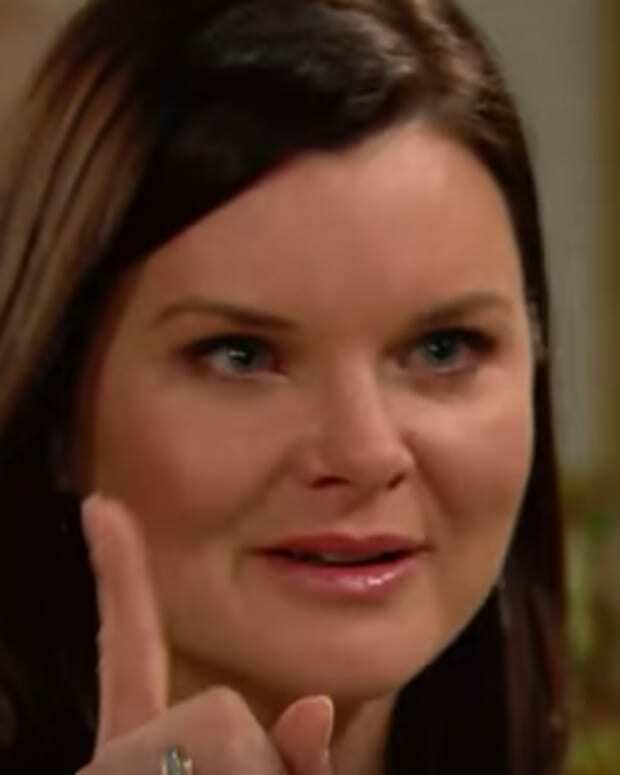 Brooke wants her engagement ring back on her finger before the real action starts.